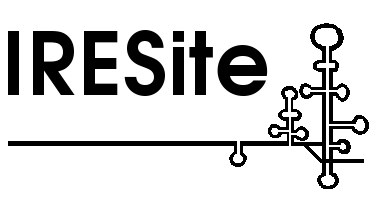 The IRESite database is currently accessible only through its web interface at http://www.iresite.org. The aim of this database is to help the scientific community with analysis of the vast amount of experimental data which accumulated from hundreds of experiments during past two decades. Although the experimental results are not directly comparable we believe the analysis is possible when certain parameters are evaluated together. Anyone is welcome to submit new data and if the data meet certain minimal criteria (like the sequence is properly labeled, gene names and references are supplied, etc.) the record is made visible to the public at the main web-site. To submit a new record you need to login first using your web browser with session cookies enabled so you do not have to enter the password after every mouse click. The email address is necessary because we must be able to contact you in case of questions related to your submission. Finally, you have your own profile where you can store your Unfinished data (submissions) and restart working with them any time later. To sort the data at the highest level we distinguish two types of records. Imagine you would like to learn something about the IRES element of the Hepatitis C virus. In the first round you want to read some summarized information and not to get lost in details of the individual hundreds of molecules used in the experiments to prove that this IRES segment exists at all! So, you would go for the entry named HCV of natural_transcript type containing basic overview of the element present in the viral genomic RNA, accommodated with its sequence, relevant citations and where known also containing its secondary structure, read the list of known interacting proteins with their descriptions, interacting regions, etc. If you get really interested in the HCV IRES you can easily lookup the HCV records of the plasmid_with_promoter_and_putative_IRES_translationally_characterized type and judge yourself whether the primary data convince you. IRESite covers a wide range of experimental data and therefore you have to choose the right record type matching exactly your case. If you are about to submit data about a plasmid vector containing putative IRES select the plasmid_with_promoter_and_putative_IRES_translationally_characterized record type (your choice in most cases). Such plasmid_with_promoter_and_putative_IRES_translationally_characterized molecules contain at least a part of it's sequence artificially inserted or modified (like a pRF plasmid containing EMCV IRES) and in other words you cannot find such a sequence in any genome (there is no sequence of pRF plasmid with EMCV IRES integrated in any genome, right?). That is why the record is called plasmid_with_promoter_and_putative_IRES_translationally_characterized (such records also include cases when IRESs was constructed assembled de novo, like IRESs selected from randomly generated sequence libraries). Be prepared to provide values describing efficiency of the putative IRES in scale to positive and negative controls. If you do not have the numbers pick-up the plasmid_with_promoter_and_putative_IRES_without_translational_characterization (described further below) record type instead. If you are about to submit data about a negative control plasmid used within your experiments (which obviously lacks the IRES segment, like an empty pRF plasmid) select negative_control_plasmid_with_promoter_and_without_putative_IRES datatype. If you are about to submit data about a promoter-less plasmid select promoter-less_plasmid_with_putative_IRES datatype. Finally, some plasmid sequences cannot be entered into the database in certain cases as plasmid_with_promoter_and_putative_IRES_translationally_characterized records while they do contain putative IRES segment their experimental characterization was so incomplete no useful data showing IRES function are available. plasmid_with_promoter_and_putative_IRES_translationally_characterized records must have Translation section filled out. If there are no data showing strength/function of IRES in experiments involving in vitro or in vivo translation select plasmid_with_promoter_and_putative_IRES_without_translational_characterization entry instead of plasmid_with_promoter_and_putative_IRES_translationally_characterized. Beware such records are rather useless and are included just for the completeness (as acquiring their sequences often took enormous time and might help the reader of the article answering some questions). In other words, the datatype plasmid_with_promoter_and_putative_IRES_without_translational_characterization differs from the type plasmid_with_promoter_and_putative_IRES_translationally_characterized only in the way that the section Translation is not facultative. When you choose from the web menu above Records/Submit new entry you will receive a web form. The web form should guide you through the submission process. The form might look too large for the first time visit but not everything must be filled-out. Some fields are optional and it is the only form you have to fill-out during the process. Typically you will resubmit the form several times using the Continue and save a copy ... button to our webserver which will perform some necessary syntactic controls of the data and check values of some fields too. Whenever there is an error found in the form the webserver returns the form back to you with all your data and with highlighted field containing the problematic data (in red color). Every form field is surrounded by a basic explanatory text which we try to keep short but informative. An additional help text is accessible by pointing the computer mouse cursor over the graphical symbol containing the question mark icon. In which order should one submit the data? The best way is to submit negative_control_plasmid_with_promoter_and_without_putative_IRES sequences first, then positive_control_plasmid sequences, then plasmid_with_promoter_and_putative_IRES_translationally_characterized entries and finally natural_transcript record summarizing the results and utilizing cellular mRNA sequence or viral genomic sequence. In case still other plasmid data are unsubmitted yet probably the plasmid_with_promoter_and_putative_IRES_without_translational_characterization record type is the fail-over choice. The reason for such order is the fact that when inserting plasmid_with_promoter_and_putative_IRES_translationally_characterized data you have to correlate IRES activity in translation relatively to positive/negative controls and for convenience of others you should refer to IRESite Id: number of their records which is assigned after you submit new data. The number is in the leftmost column in the tabular output of your Pending entries. In theory 7 minutes per record. Is it possible to postpone the data submission if I hit a problem? Yes. The submission process is time consuming and many things can happen in the meantime. Therefore, after clicking the Continue and save a copy ... button the data is not only analyzed/checked (before being returned back to you with possible error messages in red) but the contents are also saved into your account on our server. Therefore, after any Continue and save a copy ... mouse click, you may ignore any errors returned and select "Logout" from the web menu. Next time you login you can continue and fill-up the form you have not finished before. You may have several unfinished forms in your folder with postponed data! For the first attempts expect half an hour as you might realize you have to read the documentation, figure out transcription start sites from your plasmids, position of ORFs in the transcribed mRNA sequence, position of IRES within the mRNA, etc. The actual time really depends whether you have sequence data and annotation readily available or not. Shall I prepare some data in advance? We recommend you to collect in advance all the necessary data in a plain-text file which can be edited by the simplest text editor you have available (like Notepad on MS Windows). Then, you can simply cut-and-paste the data into this web form and click the "Submit to curators" button. The Remarks fields can hold unlimited amount of additional information. Typically, you may want to include additional information about the experiment itself, about the IRES element, about the translational setup, about the proteins interacting with the mRNA/+RNA molecule or about the secondary structures found in a certain region. Please note there is a separate Remarks field for each of these fields, which can keep the data connected only to the relevant sections. Therefore, you can conveniently split all your notes and put them in pieces just into the right section! The same applies to References, which are again available as a part of every of these distinct sections and thus it is very convenient for a reader to find in the section called "Protein interactions" only those references where the actual interactions were described and not intermixed with the publications describing the plasmid assembly or mixed with the publications describing the secondary structures found in whatever region of the molecule. Is there a list of minimal requirements for a record? if a plasmid construct was used to express the mRNA molecule, also sequence of the plasmid including its characteristics like promoter used to express mRNA, whether transcription was in vitro/vivo. The natural_transcript records are a simple summary of current knowledge. The natural_transcript datatype is simpler compared to the plasmid_with_promoter_and_putative_IRES_translationally_characterized records. For example, natural_transcript datatype does not have associated any information about the translation of the concrete IRES element. Of course the IRES is involved in translation within its host but the translation efficiencies are not known, they are known only based on experiments and the results are only recorded as plasmid_with_promoter_and_putative_IRES_translationally_characterized records. Thus, the natural_transcript records are thought as the summary records of all experimental results describing the respective IRES element (i.e. summary of the data stored in plasmid_with_promoter_and_putative_IRES_translationally_characterized records). Obviously, the natural_transcript records lack the attributes describing actual values measured during the experiments. The plasmid_with_promoter_and_putative_IRES_translationally_characterized records are the real experimental results characterizing new IRESs. The plasmid_with_promoter_and_putative_IRES_translationally_characterized records on the other hand require you to enter detailed information about translatability of the mRNA/+RNA molecule containing the putative IRES. Information include yields of reporter proteins synthesized during translation or other quantification of IRES activity in relative scale to controls; description of experimental controls used in the experiment and conclusion whether the IRES element is functional or not. To simplify any future analyses of promoter existence in original constructs plasmid_with_promoter_and_putative_IRES_translationally_characterized records must be accommodated with full-length sequence of the plasmid with inserted IRES and reporter genes. Why should I submit my own data? Extracting all the data from original publications looks straightforward but involves a lot of manual and creative work. Deducing the primary sequence of the plasmid containing inserted IRES is just the most difficult part and in several cases we were blocked by mistakes in published materials and had to resolve the issues with original authors anyway. Therefore we hope scientists will submit their own primary data freely and we will be happy to assist anyone who asks for assistance.